How to follow this past week's magnum opus on Andy Virgil? I thought perhaps a look at the work of Virgil's mentor, Joe De Mers, might provide a sort of continuity. 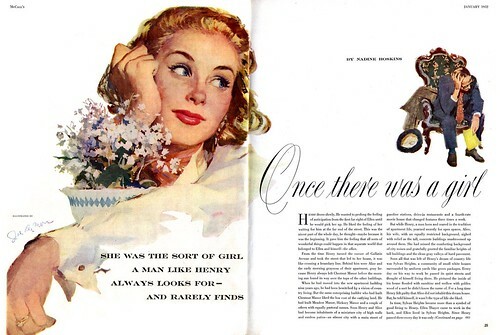 These two pieces from McCall's magazine seem particularly appropriate: Andy Virgil was apprenticing for De Mers and others at The Cooper Studio in 1951 and the first part of '52. I like to imagine he might have been present - perhaps even assisted - when Joe De Mers painted these illustrations. These pieces can be seen at full size in my Joe De Mers Flickr set. Of all the Cooper artists who primarily worked in the 'glamour' mode, I think DeMers was perhaps the most painterly. 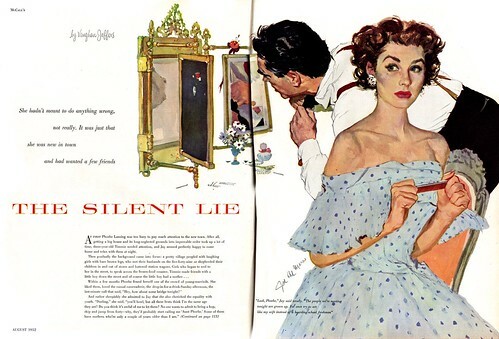 Both Coby Whitmore & Joe Bowler were maybe better visual storytellers, but to me there's a quality in DeMers' work, a kind of raw freshness. Given how sophisticated his women are, that may sound kind of weird -- but I guess I'm weird. Anyway, how cool that he was Andy Vigil's mentor! Thanks so much for posting these!